Hi !, it’s been a while, but I have been very busy in my quest to nail Mark Bolans’ signature tone from 1972-4. It is well publicized that he used Vampower amps/cabs and HH amps in conjunction with his Dallas Rangemasters (he had at least two of them). Below are my findings which I can now lay to rest now that I’ve cracked it, and as promised many months ago, here in blue are the fruits of my labour, and just 1 photo of the final amp set-up. For years the tone generated by Marc Bolan and his legendary Les Paul had eluded me and hundreds of other frustrated guitarists, so last year, I decided once and for all to try and find out exactly what he used. Marc Bolan went through many electric ‘tone changes’ starting with the 1970 album ‘A Beard of Stars’ right up to ‘Dandy in the Underworld’, but it is perhaps the sounds which he generated between 1971 -1974 on Electric Warrior, The Slider, less so Tanx and Zinc Alloy which are generally considered his best, and that is where I have channeled my efforts. By the sounds of it and the few photo’s in existence, again this appears to have been mainly Fender Strat into Vampower and Vox amps. His Rangemaster was probably used all the time, but can be very clearly heard in particular on the rhythm tracks on Motivator, Lean Love and ‘Rip-Off’ (this latter track has some great overdriven ‘separation’ in the chord work), and the solos on Lean Love, Get It On (short solo at the end when it hits the ‘G’). By the time this album was recorded, Bolan had developed a taste for transistor HH amps, as they were more reliable than the valve driven Vampowers, and the distortion channel on the IC100 and IC100S works like a dream with a Dallas Rangemaster, which incidentally does not suit every amp. Listening closely to all the electric tracks on this album (even more revealing is the ‘Slider Tapes’ CD which contains the raw recordings in progress), it would seem that all this album was recorded with his Les Paul and HH’s. The only area of slight doubt for me are the rhythm tracks on the title track which just might a Vampower amp to get that deep ‘growl’, but that is not the end of it. Gibson Les Paul: possibly originally a ’58 Plain Top or Gold Top, which was finished in an orangey-brown in deference to Eddie Cochrans’ Gretch. The construction of this guitar in conjunction with the electrics and open coil PAF’s were very important. The inconsistencies of these early pick-ups meant that Bolan had accidentally stumbled upon a couple of beaut’s. They didn’t appear to have a great output, and sometimes it was though he had to push out every note – he rarely suffered from massive feedback. They delivered a very raw and crisp note – not smooth like modern day PAF’s, and enabled him to generate a fantastic raw tone; ‘crunch’ for his rhythm and ‘biting’, ‘crisp’ lead work alike. This guitar would also have been constructed with Bumblebee capacitors, again an important element of that guitars’ tone. The nearest you can get to this guitar now is with Gibsons’ VOS reisues. They have the long neck tenon, Bumblebee caps and Burstbucker pick-ups, amongst other accurate elements, and are superb, and I have recently acquired a ’58 plain top which delivers this tone in spades. Note: even these guitars all sound different, and I tried about 10 before I found one which gave me what I was after. The Vampower amps are somewhat ‘cleaner’ than the HH’s, even though they feature a ‘bite’ control which sends them into a nice overdrive/distortion. They are also incredibly loud; my Mk1 100w head pushes out about 108 watts and I can’t even get it past 0.5 on the master volume before it’s rattling the foundations! Tracks such as Jeepster and Ride a White Swan pre ‘The Slider’ etc, appear to have been done with the Vampower. The HH IC100S (the ‘S’ stands for sustain) features a distortion channel which can be controlled, and goes from ‘crunchy overdrive’ to ‘sweet sustain’. These amps have two settings ‘studio’ and ‘stage’ and go from ‘bedroom’ volumes right up to ‘very loud’. It is possible to get a great tone at low volumes. On its’ own the distortion channel is quite ‘muddy’; a Rangemaster really tightens the whole thing up and brings it to life, with some fantastic sonic separation in chord work and some beautiful highs on solos. Open to opinion, but we know that he used HH combo’s and Vampower 4×12’s. 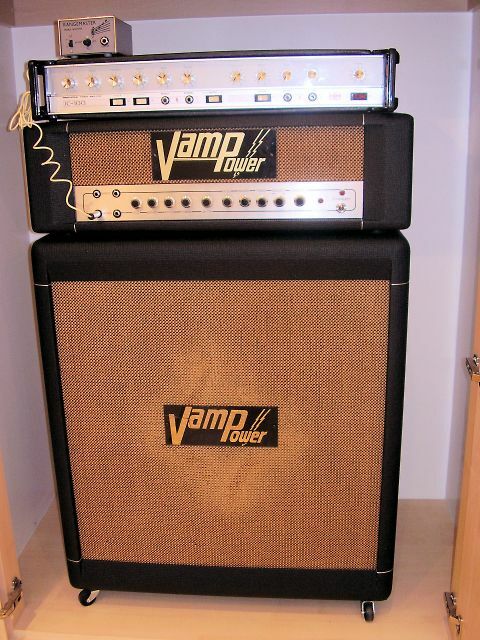 I also acquired a Vampower 4×12 cab which was loaded with Rola Celestion G12m 25’s. This nails the Slider album. I am also aware of other Vampower 4×12’s containing pre-Rola 25’s. I read somewhere recently where the effect of a Rangemaster is like that of fine grade sandpaper, an analogy which I feel is very accurate. I have had the pleasure of acquiring three RM’s, and they all sound different. My findings and the opinions of others I have counseled would suggest that the ones containing the OC44 germanium transistors deliver a smoother tone, and the OC71’s provide more ‘edge’ and higher harmonics. So if an OC44 is 1500 grade, OC71’s fall between 1500 and 2000 grade. Given this, I now believe Bolan had one which contained an OC71. The solos on tracks such as ‘Rabbit Fighter’ and ‘Ballrooms of Mars’ clearly demonstrate this. Also if you listen to ‘Buick Mackane’ just before the solo starts you can hear in the background a couple of phrases which sound as tough they have been done with a Wah Wah. They haven’t; it is the RM effect in conjunction with all the above, and one which I am now able to replicate easily with my set-up. There is a work-in-progress track on the ‘Rabbit Fighter: Alternative Slider’ CD called ‘Buick MacKane and the Babe Shadow’ – there is no doubt now in my mind that this is a raw and perfect example of his Les Paul / HH / Vamp / RM OC71 in action. How does a Beano Boost compare to an original Dalles Rangemaster? Well, it comes extremely close to an OC44 in terms of tone, really tightens up the whole sound. My ears are now so tuned in to the sonic delivery of a VOS ’58 Les Paul/HH/Vampower 4×12, that I am using that set-up as a reference point. In fact for live work I still use my Beano Boost which is a superb product, and about as close as it gets to an original Dallas Rangemaster, and comes highly recommended. The Vampower complete stack. I‘d heard about this mythological stack for years. Now let’s be honest here – every vamp owner wishes that he or she owns a long lost Vampower of Marc Bolan’s T.Rex. An understandable fantasy considering how few of these beasties were made. 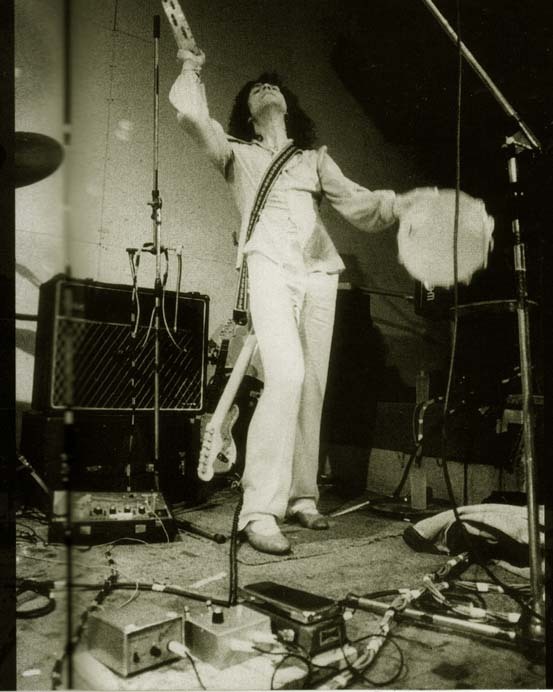 I also know that all T.Rex touring amps were stamped T.REX in white letters. This amp’s previous owner was Boz Boorer – guitarist for Morrisey and Bolan’s former band, John’s Children. Boz had tracked the amp down in Portsmouth to a local band who had told him it had been given to them by Marc’s former sound guy M ick O’Halloran (who actually lives in the area). I’ve tried to mail Mick to confirm this – but no luck. In fact – Mick if you ever read this – please contact me! Boz has also tried – so, this amp remains a mystery. After another owner, it found its way to me. What I can tell you is that it is the only complete original MK1A Vampower stack I have ever seen. All 8 Celestions have matching pre Rola codes. The amp’s black / silver knobs, 3 x original logos and Partridge trannys mean it is from the first generation of Vamps ever built. Every part on this Vampower is original and it’s very lucky to have survived intact for so long. Date code on back says 12/70 – just round the time Ride a White Swan was becoming a hit. Are these speaker cabs the actual stack used on the cover of Electric Warrior? … Now I’m even going to touch that one!